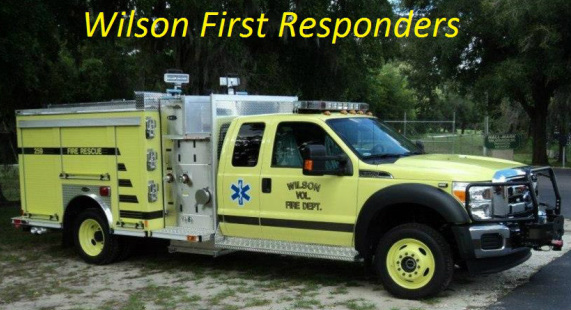 The Wilson First Responders were formed in 1985 as a division of the Wilson Fire Department. Our response area includes all 35 square miles of Wilson Township, as well as portions of Warren and Wiscoy Townships. We are one of six volunteer departments in Winona County with hydraulic extrication tools (Jaws of Life). Our jaws response area is approximately 136 sq miles and includes all of Wilson Township, and portions of Hart, Warren, Wiscoy, Homer, and Pleasant Hill townships. We provide Basic Life Support EMS to all medical emergencies in our response area, as well as motor vehicle accidents, farm accidents, and fires. Advanced Life Support is provided by nearby Winona Area Ambulance, as well as MedLink Air or Mayo One when needed. We recently purchased a 2012 Ford F-550 to act as our rescue truck. The rescue truck carries all of our EMS and rescue supplies. It also has a 750 gpm pump, 300 gallons of water, and 30 gallons of foam.